It was worth a try… and it actually worked. On June first, I posted a tweet (in Dutch) that I was looking for an experienced data management guru. It was cross-posted on Linkedin. The position was for a business critical project at ISS and I had not received any good candidates through the regular channels. I received four serious proposals within 24 hours. Recently, I signed the deal with one of them. My first social media business deal! 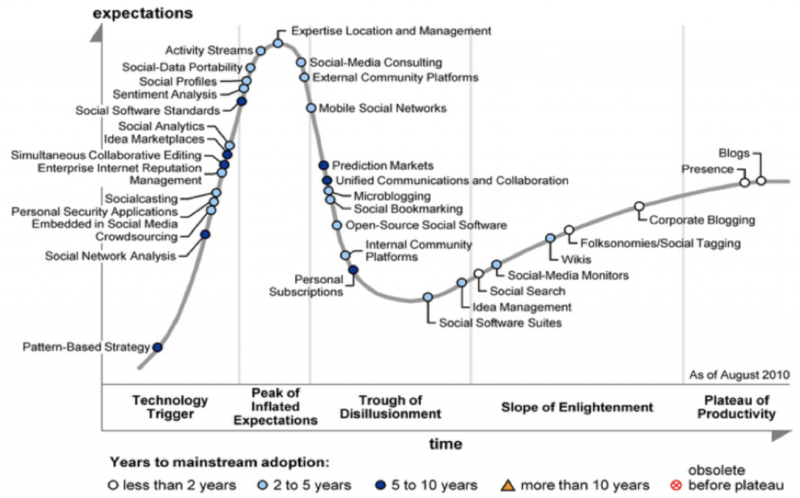 Gartner just published the 2010 Hype Cycle for Social Media, see below. On there, microblogging is diving straight into the Trough of Disillusionment. But given my fresh experience, that Plateau of Productivity can’t be all too far away anymore.